HITTITES, an ancient people of Anatolia. The name Hittites is taken from the biblical Hebrew Ḥitti (gentilic), plural Ḥittim, which stems from the form Ḥatti found as a geographic term in cuneiform texts, the vowel change resulting from a Hebrew phonetic law. The form Ḥatti is used in Akkadian. Since this name always occurs in combination with a noun, such as "country of Ḥatti," "king of Ḥatti," etc., it is uncertain whether the final-i is part of the stem or rather the Akkadian genitive ending that would make the nominative Ḥattu. The occurrence of a term Ḥattum in Old Assyrian texts (with the-m suffix of the Old Period) had been cited in support of the second alternative. The problem is, however, complicated by the fact that the same sources mention a place called Ḥattuš, whose relation to Ḥattum is not clear, and that in later periods the Hittites themselves used the form Ḥatti for both the country and its capital when they wrote Akkadian, but Ḥattuša, also in both usages, when writing Hittite, while an adjective, Ḥattili, was derived from the short form. In writing these names the Hittites often used the word sign for "silver," writing SILVER-ti for Akkadian Ḥatti, SILVER-ša for Hittite Ḥattuša. It is worth noting that one of the Ugaritic words for "silver" Ugaritic ḥtt is an Anatolian loanword (Tropper, 111, 122). Conventionally the form Ḥatti is used by moderns. Ḥatti was originally the name of the region comprising the large bend of the river Halys (Kizil Irmak) and of the city whose ruins are at the village of Boghazköy (c. 100 miles directly east of Ankara). The Hittites who ruled that country during most of the second millennium B.C.E. were invaders speaking an Indo-European language; when they arrived they found a population that spoke a different language, of agglutinative type, and this non-Indo-European tongue they called Ḥattili – "belonging to Ḥatti." Although both the name Hittite and the term Ḥattili are derived from the same geographic name, they refer to entirely different entities. To avoid confusion scholars call the old indigenous language "Hattic" or "Proto-Hattic," the people "Hattians" or "Proto-Hattians," while reserving the term "Hittite" for the Indo-European-speaking newcomers, who took over much of the civilization of the indigenous population in material culture and religion. The reason that Hattic texts have survived at all is that the Hittites still used them in the cult. Thus, there is cultural continuity, the Hattian element being an integral part of the civilization of the Hittites. The Indo-European language called Hittite by moderns was called Nesian by the Hittites themselves, the name being derived from that of Neša, one of their early capitals (see below). It is not known when or from where the Indo-European-speaking Hittites came. The problem becomes even more complex if the other Indo-European languages of Anatolia are considered. The documents of the Assyrian merchant colonies (see *Asia Minor ) give only partial answers to these questions. Among the proper names of local persons there are some that contain Indo-European Hittite elements; accordingly, some individuals, at least, belonging to the newcomers were present in Kaneš in the 19th century B.C.E. The Hittites derived their own kingdom from the kings of Kuššar, a town, according to Old Assyrian documents recently made available, situated in the mountainous region southeast of Kaneš. An important source for the early period is the inscription of a certain Anitta, king of Kuššar, found in the Hittite capital and written in Hittite (COS I, 183–85). In it the king relates that his father, Pithana, conquered the city of Neša but spared its people. When he subsequently speaks of his own deeds Anitta mentions Neša as his own city to which he brings captives and booty and where he builds temples. Thus, despite the title King of Kuššar, Neša seems to have been the royal residence. Both Pitḫana and Anitta are attested to in the Assyrian merchant documents found in the later settlement at Kaneš (see *Asia Minor ) where they apparently ruled. According to some scholars Neša and Kaneš are the same city; this theory, if correct, would greatly contribute to an understanding of the historical situation. The Hittite empire of the second millennium B.C.E. (c. 1800–1200). Based on the Westminster Historical Atlas to the Bible, Philadelphia, Pa., 1945. Anitta tells about a number of conquests, the most important being that of Ḥattuša, which he burned and whose site he cursed. Among the remains of Ḥattuša at Boghazköy, documents of the type representative of the later merchant colony were found in houses which had been destroyed by fire, perhaps indicative of the destruction by Anitta. Within the period of the later colony, Pitḫana and Anitta fall relatively late, perhaps in the middle of the 18th century B.C.E., or even later. Still, knowledge is lacking for the period between Anitta and the beginning of the Old Hittite Kingdom, whose founder was a certain Labarna, alternatively, Tabarna, king of Kuššar, indicating that the kingdom was still connected with that town. That Labarna founded a new dynasty seems likely because of the later tradition which carries historical accounts back to him, but no further; his name was taken by all later kings, so that it almost became a title (comparable to Roman "Caesar"). Labarna's conquests, learned of only from a later source, included Tuwanuwa (near Nighde) and Hupišna (Ereghli). Contemporary sources are for the first time available on his successor, who called himself Labarna (II) and King of Kuššar, but who was better known to posterity by his second name, Ḥattušili. This name is the gentilic derived from Hattuša, and, indeed, in his own inscriptions Ḥattuša figures as the capital. He moved there, apparently, despite the old curse. Labarna and his successors definitely were Indo-European-speaking Hittites; for Pithana and Anitta this is uncertain but not impossible. If one could reconstruct the course of events so that the Indo-European-speaking Hittites first held the eastern town of Kuššar and from there moved to Neša (= Kaneš? ), then to the region of Tyana (Nighde), and finally to Ḥatti, it would indicate that the last part of their movement was from East to West, which would favor the eastern route also for their entry into Anatolia. Hattušili I fought extensive wars, partly in Anatolia and partly in northern Syria. He boasts of having been the first to cross the Euphrates and of having destroyed Alalakh (Tell Atchana). As his successor Ḥattušili appointed an adopted son, Muršili (I), who continued the move toward the southeast by conquering the kingdom of Aleppo and even raiding Babylon, which marks the fall of the First Dynasty of Babylon, dated (in the "middle" chronology) 1595 B.C.E. This brings Labarna to about 1660. Muršili was assassinated, and a period of dynastic struggle followed until King Telipinu (c. 1550) introduced strict rules for hereditary succession (COS I: 194–98). After him only the names of some rulers are known. About 1450 a new dynasty came to the throne, founding the so-called New Kingdom. After modest beginnings and serious setbacks, this kingdom rose to empire under King Šuppiluliuma (I) (c. 1370–45). Being a younger son, he usurped the throne, but his military and diplomatic success atoned for the usurpation. Having reconquered the lost territories in Anatolia, Šuppiluliuma moved against the kingdom of Mitanni in northern Mesopotamia, one of the great powers of the time. After an unsuccessful first attempt, he defeated Mitanni and conquered most of its Syrian territories as far south as Kadesh on the Orontes. At a later date he took advantage of dynastic struggles in Mitanni by helping one of the contenders and installing him as his vassal. In Syria the Hittites also threatened the Egyptian possessions; Hittite sources here supplement the information contained in the *el-Amarna letters. Thus a treaty concluded by Šuppiluliuma with Aziru, king of Amurru (COS II, 93–95), shows that the latter actually switched his allegiance from Egypt to Ḥatti despite the letters he wrote to the Pharaoh. Most characteristic of the Hittites' prestige is the request of the widow of Tutankhamen, who wrote to Šuppiluliuma asking for a Hittite prince whom she would marry and make king of Egypt. The plan failed because her opponents killed the Hittite prince when he arrived, and his father had to send an army to avenge him. Šuppiluliuma's successors were, on the whole, able to maintain the empire. Muršili II (c. 1345–20) incorporated into the empire as vassals the Arzawa countries of southwestern Anatolia. Muwatalli fought the famous battle of Kadesh (1300 B.C.E.) against Ramses II of Egypt. Claimed as victory by both sides, the battle left the status of Hittite and Egyptian possession in Syria unchanged. Against the danger stemming from Assyria's rise to power, Ḥattušili III concluded a peace treaty with Ramses (1284 B.C.E.) and later (1271) gave him his daughter as wife. Friendly relations between the two powers continued from that time. Tudhaliya IV (c. 1250) still held Syria, including Amurru; most of his military activity was in the west. During his reign one foreign power, Aḥḥiyawa, probably the Akhean kingdom of Mycenae and mentioned already by earlier kings, seemed to be aggressive in western Anatolia. Under Tudhaliya's son, Arnuwanda, the situation in the west apparently further deteriorated. The last king, Šuppiluliuma II, tells of a naval victory over ships of Cyprus, but shortly thereafter the Hittite empire is destroyed. The end is marked by burnt levels in all sites and by the disappearance of written sources. However, it is not known how or by whom the destruction was brought about, or what role inner weakness may have played. The only information comes from the Egyptian records of Ramses III, which mention, in his eighth year (c. 1190), the attack of so-called Peoples of the Sea who are said to have overrun all the countries "from Ḥatti on." The downfall is followed by a dark age at the end of which the map of Anatolia had been redrawn. Small states known as Late Hittite or Neo-Hittite, because of the inscriptions written in the so-called Hittite hieroglyphs found in the areas they occupied, extended far into Syria, Hamath on the Orontes being the southernmost. In contrast to the small states of Anatolia, some – but not all – of those in Syria were taken over by Arameans: Till Barsip on the Euphrates became Aramean Bit Adini about 950 B.C.E. ; shortly after, the Aramean Gabbar founded a dynasty at Sam'al (Zinjirli), similarly the region around Arpad became the Aramean Bit Agusi about 890, while Hamath fell to the Arameans as late as about 820 B.C.E. In contrast, Carchemish on the Euphrates was ruled by "Late Hittites" (Luwians according to their language) until it became an Assyrian province in 717. The important point is that the Assyrians, who continually fought these small states until Sargon II finally incorporated them into his empire as provinces, continued to call the whole region Hatti, regardless of whether the people were Luwians or Arameans. Even more than a century after the last "Hittite" state had disappeared, the Babylonian chronicle introduces Nebuchadnezzar's first war against Jerusalem (598 B.C.E.) with the words "he went to Ḥatti." The name Hatti was now used in a vague sense for the entire Mediterranean littoral. The Anatolian Hittites of the second pre-Christian millennium seem to have left no traces in the Hebrew Bible. Those books of the Bible that mention Hittites in connection with events of the monarchy clearly refer to the "late Hittites" of that same period: "Uriah the Hittite" under David (II Sam. 11:3; I Chron. 11:41); Solomon's Hittite wives (I Kings 11:1) and the horses sent by him to "all the kings of the Hittites and the kings of the Arameans" (I Kings 10:29; II Chron. 1:17; cf. also II Kings 7:6). In contrast to these passages are those that mention Hittites as part of the pre-Israelite population of Palestine (Gen. 15:20; 23; 26:34, et al., Ex. 3:8, et al. ; Deut. 7:1; Josh. 3:10; 9:1; et al. ; Judg. 3:5; I Kings 9:20 = II Chron. 8:7; Ezra 9:1; Neh. 9:8), especially of its mountainous part (Num. 13:29; Josh. 11:3). 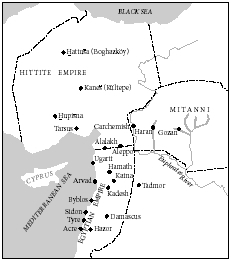 The Hittite empire of the second millennium never included Palestine. To explain these passages some scholars have adduced the so-called Khirbet Kerak ware, a kind of pottery similar to wares found in Anatolia and further east. If this pottery really attests Anatolians in Palestine, they would be Hattians at best, and the time lapse from the Early Bronze Age to the conquest would be more than a millennium, a very long time for a name to be remembered. Others have adduced a Hittite source according to which, some time before Šuppiluliuma I, some Hittites migrated from Anatolia "into Egypt." If this means Egypt proper it has no bearing on the question (despite the convenient parallel it furnishes to the Children of Israel). Only if it is assumed that "Egypt" refers to Egyptian-held territory which happened to be Palestine can the phrase serve as an explanation for the mention of those early Hittites. Neither of these theories is convincing. It is rather that the writers of the Bible used the designations "Hittite" and "Canaanite," mostly pejoratively, for the aboriginal inhabitants of the country. Esau's Hittite wives (Gen. 26:34) are called Canaanites in Gen. 27:46. "The "Hittites" of David's time, Uriah (II Sam. 11:3, 17, 21) and Ahimelech (I Sam. 26:6), may have traced their descent to old pre-Israelite families. By the eighth century, māt Ḧatti, "Hittite land" in Neo-Assyrian sources, had acquired the sense of everything west of the Euphrates up to the Mediterranean. The phrase ereẒ ha-ḥittim, "the land of the Hittites" (Josh. 1:4) is a Hebrew reflex of this usage and is absent from the Septuagint to this verse. What used to be called "Hieroglyphic Hittite" is now more accurately referred to as "Anatolian Hieroglyphic" (Hawkins, Melchert). The preserved hieroglyphic texts are actually written in Luwian, like Hittite, an Indo-European language. Although closely related to the Hittite language, Luwian is distinct. The term "hieroglyphic" used for Hittite writing was borrowed from the Egyptian terminology, and it simply implies that the Hittite writing, like the Egyptian, is pictographic. In no way does it imply that the Hittite hieroglyphic writing was borrowed from the Egyptian hieroglyphic or that it was in any way related to it. The Hittite writing was in use from about 1500 to 700 B.C.E. in a large area extending from central Anatolia to northern Syria. Two main periods are distinguished: the earlier from 1500–1200 B.C.E., and the later from 1200 to 700 B.C.E. The language of the "Hittite hieroglyphic" inscriptions is related to the so-called "cuneiform Hittite" (or "Nesian"), so named because it is preserved in the cuneiform writing borrowed from Mesopotamia. Both of these languages and writings were used at the same time in the Hittite Empire, but while the use of cuneiform Hittite was limited to a small area around Boghazköy, the capital of the empire, and died out at the time of the empire's collapse around 1200 B.C.E., "hieroglyphic Hittite" (i.e., Luwian) was used throughout the empire, and remained in use up to about 700 B.C.E. The deciphering of Hittite hieroglyphic writing was achieved only in the 1930s through the combined efforts of P. Meriggi, I.J. Gelb, E.O. Forrer, H.T. Bossert, and B. Hrozný. In the years after the Second World War, a great advancement in the deciphering of Hittite writing and language resulted from the discovery of bilingual Hittite and Phoenician inscriptions at Karatepe in Cilicia. Two formal types of writing existed. The first was a monumental type with signs faithfully imitating the forms of pictures. The second, a cursive type, developed from the monumental type, with forms of signs so divergent from the original pictures that it is often difficult – if not impossible – to recognize their original pictographic form. Hittite writing, like such other ancient Oriental systems as the Mesopotamian, Egyptian, and Chinese, represents word-syllabic type of writing. It consists of three classes of signs: logograms or word signs; syllabic signs, developed from the logograms by the rebus principle; and auxiliary marks and signs, such as punctuation marks and signs for determinatives, classifiers, or semantic indicators. In the use of logograms and auxiliary marks and signs, the Hittite system is identical or very similar to other word-syllabic systems. The normal Hittite syllabary consists of about 60 signs of the type ta, ti, te, tu, each representing a syllable beginning with a consonant and ending in a vowel. The writing does not indicate any distinction between voiced, voiceless, and aspirated consonants. Nowhere but in the Aegean area in writings such as Linear B and Cypriote is there a syllabary identical to that of the Hittites. Accordingly, Hittite hieroglyphic writing can be assigned, together with Cretan writing and its derivatives, to the Aegean group of writings. Pritchard, Texts, 120–8, 207–11, 318–9, 346–61, 393–401, 497–518; H.G. Güterbock, in: V. Ferm (ed. ), Forgotten Religions (1950); idem, in: EM, 3 (1958), 320–55; idem, Mythologies of the Ancient World, ed. by S.N. Kramer (1961), 141–79; O.R. Gurney, The Hittites (1961); E. Akurgal, Art of the Hittites (1962); CAH2, vols. 1–2. ADD. BIBLIOGRAPHY: J. van Seters, in: VT, 21 (1972), 64–81; idem, In Search of History (1983), 100–126; J.D. Hawkins, in: World Archaeology, 17 (1986), 363–76 (with bibliography); idem, Corpus of Hieroglyphic Luwian Inscriptions…Iron Age (2000); idem, G. McMahon, in: BA 52 (1989), 62–77; idem, ABD, 3:228–31; I. Singer, apud S. Izre'el and I. Singer, The General's Letter from Ugarit (1990), 115–83; G.O. Gurney, The Hittites (1991); P. Houwink ten Cate, ABD, 3:219–25; R. Drews, The End of the Bronze Age (1993); H. Hoffner, apud M. Roth, Law Collections from Mesopotamia and Asia Minor (1995), 213–54; idem, Hittite Myths (1998); idem, Encyclopedia of Religion, 6:4068–73; S. Ahituv, Joshua (1995), 73; H.C. Melchert, in: P. Daniels (ed.) The World's Writing Systems (1996), 12–24; G. Beckman, Hittite Diplomatic Texts (1999); J. Tropper, Ugaritische Grammatik (2000).